When I went to Wilton tent sale, the item I was most excited about was the baked doughnut pan. I had made baked doughnuts in the past, but used a recipe where I had to punch out the doughnuts using two different sized cookie cutters. They were a lot of work, and these pans seemed like an easy workaround! The pans lived up to my expectations and made the doughnuts much easier to make. But while they look super cute, they aren’t very good. In fact, they’re bland, spongy, and just all around eh. Usually when I bring stuff into work, people are constantly saying how good the treat is. With these, everyone said they looked really good. That’s a bad sign! Preheat oven to 425°F. Spray the doughnut pan with nonstick cooking spray. Bake 7-9 minutes, or until the top of the donuts spring back when touched. Cool in pan for about 4-5 minutes before removing from pan. 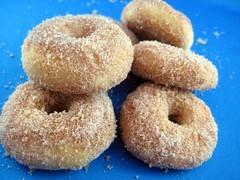 Complete donuts with either a dusting of powdered sugar, glaze, or cinnamon-sugar topping. Microwave on 50% power for about 1 minute, stirring in-between, until melted. Stir in 1 teaspoon hot water until the glaze has thickened. Add another teaspoon hot water if the glaze is too thick. Recipes from Wilton doughnut pan packaging. Last week I made these cupcakes for a friend’s bridal shower and had some buttermilk leftover. Before learning I could freeze buttermilk (who knew? ), I made the buttermilk cake squares (yum! 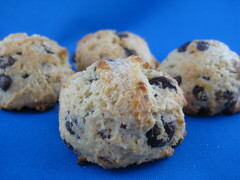 ), then this scone recipe showed up in my Google Reader (thanks The Food Librarian!) and boom, leftover buttermilk be gone. I followed the drop scone directions–scoop and bake–rather than shape into a circle and cut into wedges. The scooping was easy and the scones all came out around the same size. The end result was slightly crispy on the outside and soft and moist on the inside. They weren’t as dense as the scones I’m used to, but they were definitely delicious and super easy to make. Line with Silpat or parchment two baking sheets. In a large bowl, mix together flour, sugar, baking powder, baking soda and salt. In a small mixing bowl or your measuring cup, blend together buttermilk, egg yolk and vanilla. Set aside. Pour buttermilk mixture over the flour mixture and mix until dough comes together. Do not overmix. Dough will be moist and soft. If you want to make triangle scones, gather the dough and press out on floured surface into an 8-inch round. Cut into 6 wedges. If you want to make drop scones, use a scooper to scoop dough onto lined baking sheets. Brush tops of scones with milk and sprinkle with sugar. I got about 20 scones using a small cookie scoop. Recipe from Bon Appétit via The Food Librarian. 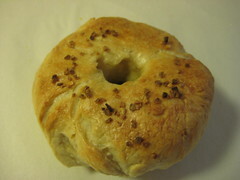 Growing up, bagels or (non-sugared) cereal were what we ate for breakfast regularly. On weekends my mom would make us these baked pancakes with apples and cinnamon, but most of the time it was bagels. 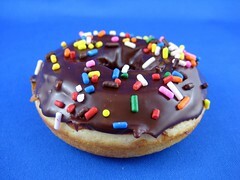 In fact, until I went away to college I had never even tasted a Pop Tart or eaten a doughnut for breakfast, and to this day, doughnuts for breakfast are just odd to me. I’ve been told this is a Jewish thing. Back to the bagel. There are two kinds of bagels: good bagels and bad bagels. Good bagels have a tough exterior and are chewy on the inside. Bad bagels have a soft exterior and are bready on the inside. Seriously, it’s that simple. My family would usually buy a dozen bagels at a time, and we’d eat them throughout the week, in various ways. For breakfast you can eat them with a schmear (and lox), with jelly, with melted cheese, you name it. At lunch time, you can use a bagel in place of loaf bread in a sandwich. And for dinner–the pizza bagel (my sister and I loved these)! See, bagels are a multi-purpose food. And you can freeze them too. Which is what I did with some of these. To make the sponge, stir the yeast into the flour in a 4-quart mixing bowl. Add the water, whisking or stirring only until it forms a smooth, sticky batter. Cover the bowl with plastic wrap and leave at room temperature for approximately 2 hours, or until the mixture becomes very foamy and bubbly. It should swell to nearly double in size and collapse when the bowl is tapped on the countertop. To make the dough, in the same mixing bowl (or in the bowl of an electric mixer), add the additional yeast to the sponge and stir. Then add 3 cups of the flour and all of the salt and malt (I used brown sugar.). Stir (or mix on low speed with the dough hook) until the ingredients form a ball, slowly working in the remaining 3/4 cup flour to stiffen the dough. Transfer the dough to the counter and knead for at least 10 minutes (or for 6 minutes by machine). The dough should be firm, stiffer than French bread dough, but still pliable and smooth. There should be no raw flour – all ingredients should be hydrated. The dough should pass the windowpane test and register 77 to 71 degrees F. If the dough seems to dry and rips, add a few drops of water and continue kneading. If the dough seems tacky or sticky, add more flour to achieve the stiffness required. The kneaded dough should feel satiny and pliable but not be tacky. Immediately divide the dough into 4 1/2 ounce pieces for standard bagels, or smaller if desired. Form the pieces into rolls. Cover the rolls with a damp towel and allow them to rest for approximately 20 minutes. Place each of the shaped pieces 2 inches apart on the pans. Mist the bagels very lightly with the spray oil and slip each pan into a food-grade plastic bag, or cover loosely with plastic wrap. Let the pans sit at room temperature for about 20 minutes. Check to see if the bagels are ready to be retarded in the refrigerator by using the “float test.” Fill a small bowl with cool or room-temperature water. The bagels are ready to be retarded when they float within 10 seconds of being dropped into the water. Take one bagel and test it. If it floats, immediately return the tester bagel to the pan, pat it dry, cover the pan, and place it in the refrigerator overnight (it can stay in the refrigerator for up to 2 days). If the bagel does not float. Return it to the pan and continue to proof the dough at room temperature, checking back every 10 to 20 minutes or so until a tester floats. The time needed to accomplish the float will vary, depending on the ambient temperature and the stiffness of the dough. Preheat the oven to 500 degrees F with the two racks set in the middle of the oven. Bring a large pot of water to a boil (the wider the pot the better), and add the baking soda. Have a slotted spoon or skimmer nearby. Remove the bagels from the refrigerator and gently drop them into the water, boiling only as many as comfortably fit (they should float within 10 seconds). After 1 minute flip them over and boil for another minute. If you like very chewy bagels, you can extend the boiling to 2 minutes per side. While the bagels are boiling, sprinkle the same parchment-lined sheet pans with cornmeal or semolina flour. (If you decide to replace the paper, be sure to spray the new paper lightly with spray oil to prevent the bagels from sticking to the surface.) If you want to top the bagels, do so as soon as they come out of the water. You can use any of the suggestions in the ingredients list or a combination. Remove the pans from the oven and let the bagels cool on a rack for 15 minutes or longer before serving. Recipe from Peter Reinhart via Smitten Kitchen. My first ever job was working at a Mrs. Fields bakery called La Petite Boulangerie while I was in high school. During the summer and on weekends, I would arrive at the bakery at 6:30 in the morning (can you believe they trusted a 16-year-old with keys to the place?) and along with the baker, prepare all the muffins, cookies, and breads for sale. The last thing out of the oven was always the cinnamon rolls and sticky buns, and the smell of cinnamon would permeate the bakery for hours. On the rare occasion we didn’t sell out of these goodies, I’d bring them home to my family and we’d microwave them before gobbling them up. And every so often, I’d put one aside in the morning and my dad would stop by the bakery for a sticky bun fresh out of the oven. They quickly became one of his favorite treats. So, when I found this recipe I bookmarked it and knew I had to bake them the next time I was at my parents’ house, and I’m so glad I did. 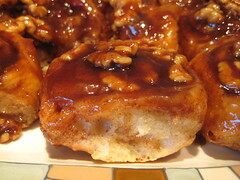 The buns are soft and flavorful, and the sticky sauce is the perfect combination of maple and cinnamon. In fact, you may even be tempted to eat it by the spoonful. Photos of the long yet not difficult process here. In the bowl of an electric mixer fitted with the whip attachment, combine the egg yolk, milk, vanilla, zest, and one-third of the flour. Mix on medium speed until it is a smooth paste. Add the butter in pieces and mix to combine. Place the dough in a lightly greased bowl and cover with plastic wrap. Set aside in a warm place to rise until doubled in volume, 1 1/2 to 2 hours. Generously butter a 9×13 inch baking pan. In a medium saucepan, combine the butter, brown sugar, maple syrup, and cinnamon, stirring until it reaches a rolling boil. Remove from heat and pour into the prepared pan. Set aside to cool. When the dough has doubled in volume, punch it down and turn it out onto a lightly floured work surface. Roll out the dough into a rectangle that is 12 inches wide by 18 inches long. For the egg wash: In a small bowl, using a fork, whisk together the egg and milk. Using a pastry brush, brush it over the surface of the dough. 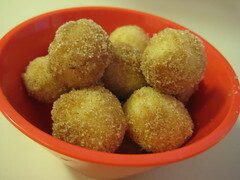 For the cinnamon sugar: In a small bowl, combine the cinnamon and sugar. Sprinkle over the dough, leaving unsugared the bottom 1 inch of one long side of the rectangle. Starting at the top edge of the rectangle, roll the dough toward you jelly-roll style and pinch the bottom seam closed. Slice the roll into 12 pieces approximately 1 1/2 inches thick, and place them cut side up about 2 inches apart on top of the sticky sauce in the pan. Spray the buns lightly with nonstick vegetable cooking spray and cover with plastic wrap (or lighly butter one side of the plastic wrap). Refrigerate overnight. When you are ready for the final rise, remove the buns from the refrigerator. Bring about 3 quarts of water to a boil. Place an empty roasting pan large enough to hold the water on the bottom of your cold oven. Pour the boiling water into the pan. Remove the plastic wrap from the buns. Position a rack in the center of your oven. Place the pan on the rack in the oven (do not turn it on!) and shut the door. The steam of the water will help the buns in their final rise. The buns will just about double in size in 30 to 45 minutes. (If your fridge is on a super-cold setting, the buns may need a little longer to rise. If they need more time, just boil some more water and refill the roasting pan.) When the buns have doubled in volume, remove them (and the roasting pan filled with water) from the oven. Bake for 20 to 25 minutes, or until golden brown. Remove to a wire rack to cool for about 10 minutes. Using tongs, turn the buns over onto a serving dish. Pour the sticky sauce in the pan over the buns and sprinkle with the chopped almonds. Recipe adapted from Not Microwave Safe.